The BlackBerry KEY2 looks set to feature 6GB of RAM and an improved processor. The upcoming device that will be manufactured by TCL Communication recently received a number of certifications signaling a nearing release. And now, after various renders revealed the new smartphone’s design, a new spec sheet appears to detail the device’s internals. Starting off with power, TCL Communication looks set to include a more powerful chip. Specifically, the octa-core Snapdragon 660 replaces the Snapdragon 625 seen in last year’s BlackBerry KEYOne. Furthermore, the new processor is coupled with 6GB of RAM and a respectable 64GB of internal storage, although this will be expandable via microSD cards of up to 2TB of storage. Moving on to the outside of the device, the rear of the smartphone is said to be adorned by a new dual-camera setup comprised of a main 12-megapixel sensor and a secondary 8-megapixel lens. In addition, the new BlackBerry device is said to boast an 8-megapixel selfie camera. Also up front is understood to be a 4.5-inch display with a 3:2 aspect ratio. This matches the display seen on last year’s KEYOne which featured a resolution of 1080 x 1620 pixels. The sleeker design on this year’s variant, unfortunately, does seem to have forced TCL Communication to reduce the size of the battery, which now sits at 3,360mAh as opposed to 3,505mAh. 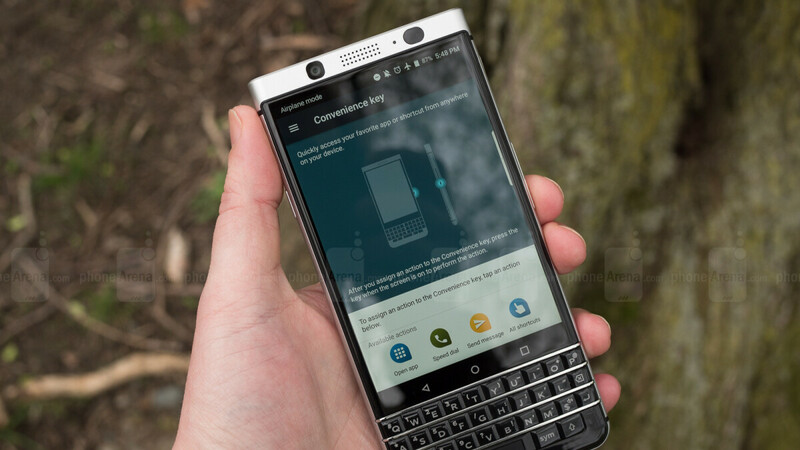 In any case, notable visual improvements to the BlackBerry KEY2 include a refined physical keyboard that now boasts a matte finish instead of the glossy one seen last year and a darker look overall, similar to that of the Black Edition BlackBerry KEYOne. In terms of pricing and availability, the KEY2 is expected to start at around $550, with an announcement likely to take place in June. Solid upper midranger especially if it comes with wireless charging and some type of water resistance. Decent mid ranger is the best I could probably say about it. I don't think it will have the comparable price point though like its expensive predecessor. I wonder if the panel is going to be OLED this year and perhaps that may be another reason why they don’t feel the need to stuff a huge battery in this time. The 6GB of RAM is exactly for productivity reasons because it helps with having multiple applications running. As far as the aspect ratio, Blackberry would prefer a 1:1 but Android doesn’t allow that so hence 3:2 is the next best thing they can offer. They could go 4:3 which Android does support. Not just in tablets, I owned both previous 4:3 devices with the LG Intuition and Pantech Pocket. The LG was kneecapped with a horrible camera but otherwise was great. The Pantech blew chunks, no redeemable virtues to speak of other than the wide display. If the battery life is anywhere near the KeyONE's then the smaller battery will go unnoticed. I like the bump in RAM as the DTEK security system is a wee bit of a resource hog. A necessary evil considering the security chops DroidBerrys have always enjoyed. I won't swap my 8+ for this as a daily driver but I may explore a limited work-only role if the camera is as advertised. A bump in the RAM is nice considering that blackberry chose to release the better model of the KeyONE later instead of releasing it in the beginning and instead. That battery reduction is a cautionary problem though. That would be a cause for concern. Would probably be a good backup phone if priced right. I don't think it could replace my Pixel as my main device. BB aurora have dual sim. But nobody cares. Hopefully that will be the case. Thanks to that tiny screen. I get that they are trying to make these phoens as cheaply as possible but why not use like an SD 820, those are 3 or 4 years old now, still plenty powerful and probably cheap enough they could still sell the phone at a mid range to low premium price. Because the 660 is better combination of power and battery life. Make that all screen and I will buy one.